A bit of a dream and a lot of hard work have combined to reap some very palatable rewards for an Okete couple. who saw the first bags of their fresh organic produce “fly off the shelves” recently at The Herbal Dispensary. 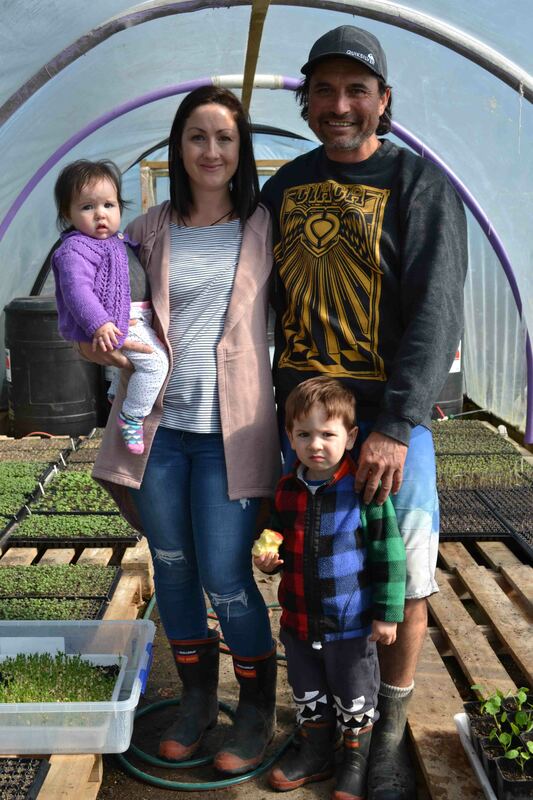 Kylie Robinson says it’s nice their Soul Food Farm venture – so long in the pipeline – has come together and that husband Eddie’s market gardening efforts are now paying off. The 35-year-old stay at home mum with two-year-old son Kalani and seven-month daughter Havana downplays her role in preparing the paddock, hand-planting the seedlings and then harvesting them – but Eddie reckons she did the hard yards too. There were daily commutes throughout last March and April from Waitetuna – where they were wrapping up a previous contract – to get the site ready on the Okete Rd dairy farm the pair now manage. They’d negotiated the lease of an extra plot of land with farm owner Alan Hall who was “kind enough to give us a crack at developing it”, says 41-year-old Eddie. It was quite a process: killing off the grass to get bare land, levelling it, re-fencing, trucking in 30 cube of organic compost and transferring two polytunnels or greenhouses onto the site. Then Eddie set about hand-planting thousands of seedlings which had been nurtured in a smaller polytunnel adjacent to the home they moved into in May. Soul Food Farm was finally up and running. While the enterprising pair provided The Herbal Dispensary with the produce from two harvests in that first week of business, it’ll soon be more full on as they also start supplying The Shack and Wallis Bistro with “earth-to-table” salad vegetables and herbs. Last month the couple had a shipping container, outfitted with windows and doors, moved on site to use for processing. Here the harvest is washed and spun in a converted washing machine, then dried on racks with fans – which takes minutes – before being chilled and delivered ready-to-eat the next day. This quick process ensures a shelf life of up to 10 days, Eddie says. Also in the packhouse is his homebuilt germination chamber – an old fridge with a crockpot full of water plugged in on low – where trays of Kings seeds are stacked and begin to sprout. In the warm, insulated space turnips, radishes and spring onions take roughly three days to germinate while kale and rocket, for instance, need only about two. While they’ve started small, the couple plan to invest in some machinery to make things more efficient. A quick-cut greens harvester for instance could access and bag baby leaves from a 20-metre bed in minutes, compared with the half hour-plus it takes by hand. A seeder would be a boon, says Eddie, to plant more densely and accurately. And a paper pot transplanter is next on the wishlist. But the chief financial officer says not yet, Eddie quips, looking sideways at Kylie. “Maybe next year,” she says. From the positive response they’ve had to the venture, Kylie’s convinced Raglan locals do want to buy fresh organic produce and are mindful of where it comes from. “It’s neat to be part of that (trend),” she says.